As February 2017 approached, it was time for our next cruise pack mission - this time to Falmouth, Jamaica. One year earlier, I had made contact with the Hague Primary & Infant School in Falmouth. The Guidance Counselor, Ms. Terry Williams, was very excited that we wanted to visit her school and so was I. Over the next several months, I spent time promoting the trip and thankfully got several people interested. In the end, there were twenty-one (21) of us ready to warm the hearts and bring smiles to the faces of several students at the Hague Primary & Infant School. February 20, 2017, arrived and we set sail aboard the beautiful Independence of the Seas, one of Royal Caribbean's big ships. The vessel is beautiful and has several features for all to enjoy: a surf simulator, a basketball court, rock climbing, ice-skating rink, the Royal Promenade with shops and restaurants, lounges and a main theater. There are three main dining rooms and other places for complimentary meals plus eateries attracting a charge. For example, there is a Ben & Jerry's Ice-cream shop onboard. The cruise sailed out of Ft. Lauderdale and stopped in Labadee, Haiti, before arriving in Falmouth, Jamaica. 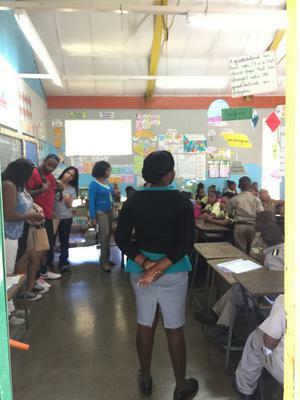 It was time for our cruise pack mission to the Falmouth primary school. 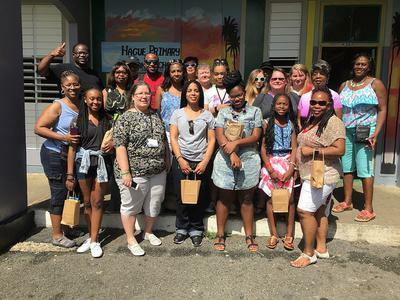 We were in for an exciting cruise pack mission to Falmouth, Jamaica. We headed ashore, twenty-one of us with twenty-five backpacks loaded with needed school supplies for the less fortunate students at the school. The plan was to hand off the backpacks to the guidance counselor and then split our group into smaller groups to visit individual classrooms. We arrived at the school via an air-conditioned coach bus ($15 per-person roundtrip), and met with the principal and the guidance counselor. The welcome was heartfelt, as our group handed off the backpacks and was then allowed to visit five (5) grade 4 classes. Prior to arriving at the Hague Primary & Infant School, I had divided the team into five (5) groups and had given the each leader an outline of what to do and say in each classroom. To speak generally of the plan: each group was to speak to the students about respecting their parents/guardians, their teachers and honoring God; and believe that they could be whatever they wanted to be. 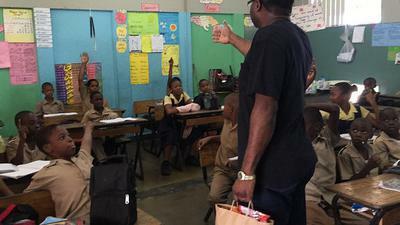 After the talk, the students would be questioned and six children would receive a gift. The remaining students were given a candy bar from a goody bag. (There was also a goody bag for each teacher.) Finally, the students got a chance to ask questions. The plan was very well executed. Each group spent twenty-five or more minutes in its respective classroom. Upon leaving, the consensus was that it was a very heartwarming time. The students were excited to see the visitors and were ecstatic about receiving goodies. In addition, they were curious to learn from the visitors and asked questions about our personal lives and about the United States. 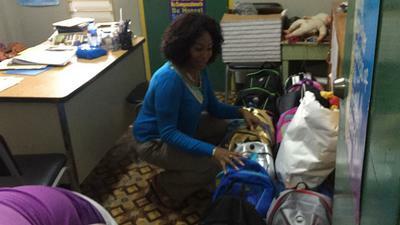 It was an exciting cruise pack mission to Falmouth, Jamaica. After leaving the school, most of us visited the Blue Waters Beach before heading back to the cruise terminal. I am so thankful for all those who invested their time and money to be a part of the trip. 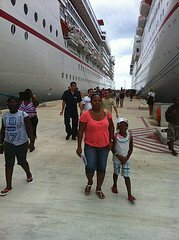 Some group members on this cruise pack mission had joined me on previous trips and others were new. They heard about it and wanted to be a part of the mission. Thanks a bunch! Having completed another successful cruise pack mission, I am now ready to start the next one. I encourage you to look out for information on our next trip and make plans to join us. Join in and write your own page! It's easy to do. How? Simply click here to return to Cruise Pack Mission.